Established in 1842 and ranked among the top technical universities in the world, Delft University of Technology in the Netherlands, also known as TU Delft, is a modern university rich in tradition. TU Delft’s commitment to socially responsible scientific and technological advancement is backed by its eight faculties and over 40 Master of Science programs, as well as thriving undergraduate and postgraduate curriculums. Student enrollment has been so prodigious in recent years that the university has had to limit undergraduate enrollment using a weighted lottery procedure. To enhance the learning experience and make greater use of limited physical space, TU Delft installed AV systems to expand the use of instructional spaces and facilitate multiple AV lecture sources. The AV system design that made this possible includes Extron VN-Matrix real-time streaming products, MGP 464 Pro multi-window processors, DMP 128 audio digital signal processors, and TouchLink control systems. Extron XTP digital switching also serves a critical role, providing signal routing in Crouwel Lecture Hall, the University’s first Next Generation Classroom. Extron streaming, switching, signal processing, audio, and control products facilitate more effective instruction, and extend high quality instructional experiences to a greater number of students. With the VN-Matrix encoders and decoders each having a fixed propagation delay of 35 ms, our total chain latency was very much within our requirements. The primary objective was to increase classroom utility and serve more educational practices. Rather than renting spaces or building new facilities, which would be expensive and time consuming, TU Delft sought to use AV technology and unique multi-purpose furniture to enhance existing classrooms and provide more tools for instructional use. Key audio visual challenges included managing multiple AV sources, digitizing handwritten content from virtual chalkboards, and reliably extending AV signals across campus in real-time to reach students in more classrooms. Piet van der Zanden, PhD, Advisor for ICT in Education, identified that instructional spaces were not used consistently throughout an academic year. Lecture halls were used extensively for introductory courses during the first half of a year, but were used less frequently as the year progressed. Conversely, collaborative workgroups rarely gathered in small spaces at the start of term, but were used extensively towards the latter part of the academic year. TU Delft has a policy of strongly encouraging cross-disciplinary collaboration between students from various departments. These campus-wide collaboration efforts have called for a blended approach, which incorporates digital online content alongside lecture and coaching. Instructors in science-based courses in particular, draw instructional material from a variety of audio and video sources. To increase lecture effectiveness, professors at TU Delft wanted to present digital content from many sources, including a virtual chalkboard, into one cohesive presentation. The University sought to meet these needs, while making the system intuitive and simple to operate and manage. In Crouwel Lecture Hall, sources include one PC with four outputs, a visualizer, a laptop, several cameras, a virtual chalkboard, Skype, videoconferencing, and occasional BYOD devices. Crouwel Lecture Hall features three displays, including the virtual chalkboard, a 2x2 videowall, and a projection display. An Extron MGP 464 Pro four-window processor manages multiple images on the right-most display, which also displays video signals from the visualizer, laptop, and camera. An Extron XTP CrossPoint 1600 digital matrix switcher plays a critical role in managing digital sources in Crouwel Hall. It replaced a DVI switch with the added benefit of XTP twisted pair input and output connections for AV transport. 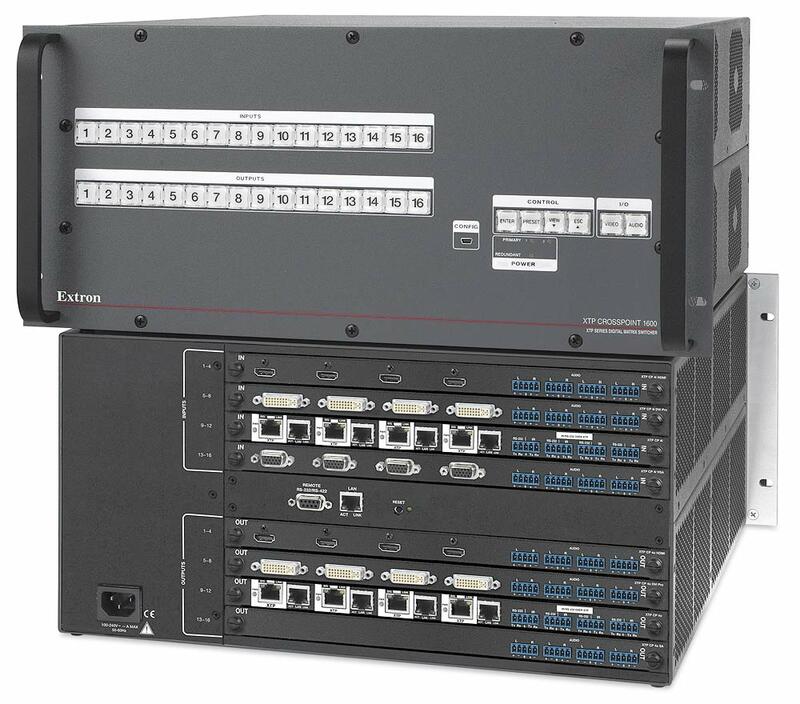 The XTP CrossPoint 1600 provided a reliable switching solution to connect AV devices over cable runs of up to 100 meters. University staff also appreciated the system information and configuration controls offered by the XTP embedded web interface. Extron TLP 350MV TouchLink touchpanels and IP Link control processors located in Transmit and Receive classrooms provide a simple and intuitive interface for university staff to manage classroom AV systems and campus-wide streaming. AV assets across campus are managed using Extron GlobalViewer software. The system’s multiple AV sources required a solution for audio mixing and digital signal processing. For this requirement, the university turned to Extron’s DMP 128 ProDSP™ Digital Matrix Processor to manage microphones and other audio sources in the lecture halls. All Transmit and Receive classrooms also used Extron HAE 100 HDMI audio de-embedders, XPA 1002 two channel amplifiers, and Extron wall speakers. The new system streams lectures from the larger halls to students in the smaller rooms for increased capacity during the start of term, while the multi-use rotating furniture allows the previously unused lecture halls to support smaller collaborative groups later in the year. With its Next Generation Classrooms, TU Delft has enhanced the learning experience, making instruction more effective with access to more AV sources. They are able to fit more students into existing spaces, saving TU Delft untold thousands by maximizing classroom space. Crouwel Hall features three displays that may present up to six different images simultaneously.